The clinic is open Monday – Saturday. No doctors referral is necessary. 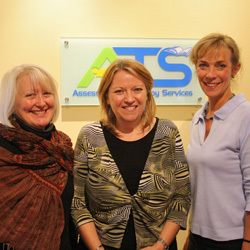 Assessment and Therapy Services (ATS) is easily accessible by public transport. The centre is a 10 minute walk from North Sydney station. Buses leave from the station and run along either the Pacific Highway or Miller Street. Buses also run along Falcon Street between Crows Nest and Neutral Bay. Metered car parking is available in front of ATS and the Ridge Street Council car park is located opposite the clinic (charges apply).